Introducing Trans Resveratrol 98% 1000mg Green Tea Acerola Cherry Vitamin C Polyphenol Antioxidant from Wotzinurfood. 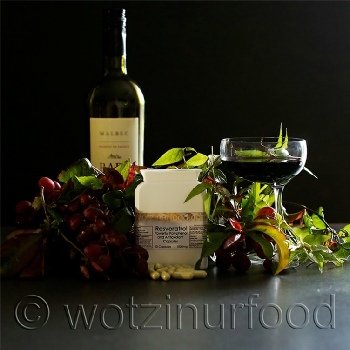 Resveratrol is a highly biologically active natural polyphenols and antioxidant compound, mainly from peanuts, grapes (red wine), Polygonum cuspidatum, mulberry and other plants. Also resveratrol known as stilbenol, is a chemopreventive agent for tumours, for the reduction of platelet aggregation, for prevention and treatment of atherosclerosis, cardiovascular and cerebrovascular diseases. Resveratrol was initially used as a plant antitoxin. In order to prevent fungal infection, the grape itself in the growth process produced this kind of antitoxin. Cardiovascular Protection which can benefit conditions including atherosclerosis and prevention and treatment of coronary heart disease and cardiovascular protection efficacy. Weight loss lipid-lowering effect. It is common knowledge that French people eat very high fat foods yet have very low heart disease which is down to the high consumption of red wine which contains high amounts of resveratrol. Occasionally high amounts of resveratrol can cause insomnia, anxiety, joint pain which can be reduced by consumption of Vitamin C and Green Tea. These have been added for your benefit and to improve the overall benefits of resveratrol. It is also advised to exercise caution if using blood thinning medications prescribed from your doctor. If you experience any symptoms, reduce the amount until you find your own comfort zone. Our Premium Acerola Cherry Powder acts as an anti-inflammatory, reducing swelling throughout in the body’s systems. Acerola cherries have also been effective in treating sore throats, fever, constipation, scurvy, and diarrhoea. The cherry, has been used in ancient medicine to relieve headaches combat dysentery, fight infections, and cure liver problems. It also contains Black Pepper to aid absorption. Green tea is one of the healthiest drinks available. It's packed full of antioxidants and nutrients that have wonderful effects on your body. This includes elevated brain function, fat loss, a lower risk of cancer and many other incredible benefits. Protection against cancerous free radicals, including breast cancer and prostate cancer, improved brain function protecting against Alzheimer's disease, fat burning capabilities, diabetes and cardiovascular disease. 50 capsules 1000mg Size 00. Capsules are beef gelatin and are kosher and halal. Capsules can be carefully split and the contents put into liquid if the 00 capsules are too big. You can request vegetarian when you order. Do not take if allergic to any ingredients. Processed in a premises which handles nut, seeds and spices.